Guest access in Planner lets you and your team collaborate and participate with people from outside of your organization by granting them access. 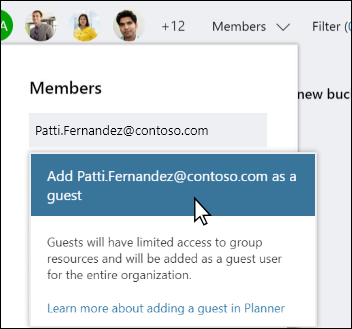 For more information on how guest access in Planner works, including the limited tasks that guest users can perform, see Guest access in Microsoft Planner. Important: To be able to add a user from outside of your organization as a guest to a plan in Microsoft Planner, the user needs to be invited as a guest to use Microsoft Planner, Groups, or SharePoint. Note: Looking for how to add people inside your organization to your plan? See Add people to your plan. In planner, select Members, and then begin typing the name of the person you want to add. Planner will detect that the user isn't already in the system and prompt you to add the user based on their email address. Type in the email address of the user you want to add as a guest. If the user has already been invited to use Planner, Groups or SharePoint, you can select them from the list, just as you would an internal user. 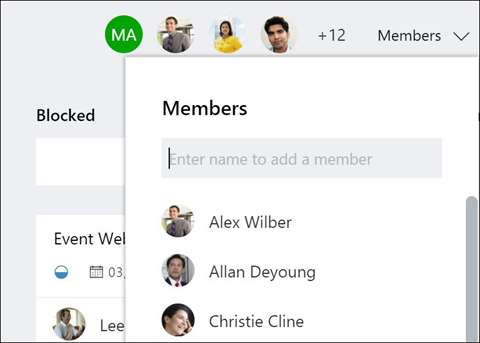 Note: Users from outside of your organization need to be invited as a guest to use Microsoft Planner, Groups, or SharePoint, or you will not be able to add them as a guest to the plan. Select Add patti.fernandez@contoso.com as a guest. Verify that the guest has been added by selecting Members and reviewing the members list.